The bulk and majesty of a solitary bull (male) moose moves deliberately through a forest of aspen. He appears and disappears as he weaves through the trees in deep snow. The mating season completed, this bull will drop his antlers soon in order to conserve energy for the winter. A new set of antlers will grow in the spring. 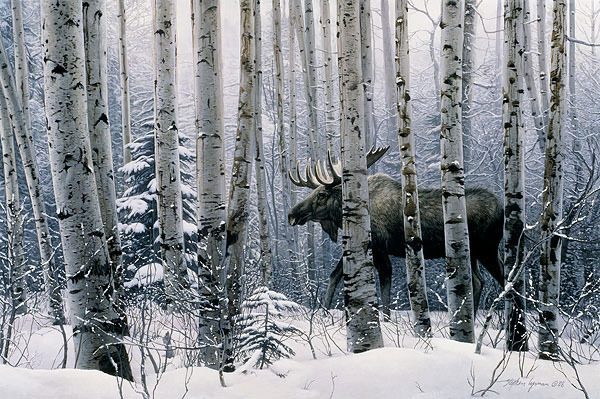 The moose and the American aspen are native to much of the same North American territory. A Walk in the Woods is an iconic Stephen Lyman image: a spectacular wildlife subject, ensconced in its habitat.